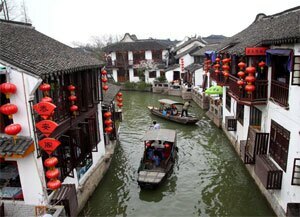 Zhujiajiao Water Town is situated forty seven kilometers away from Shanghai. It is a typical and ancient water town in Qingpu District, south of the Yangtze River, which has almost 1,700 years of history. 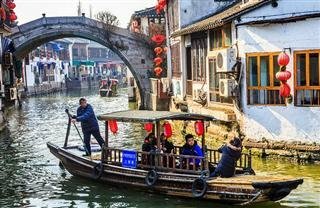 Zhujiajiao, also called “The Venice of Shanghai”, features lovely waterways, curved rock bridges, old streets cemented with stone, and over 10,000 buildings dating back to the Ming (1368-1644) and Qing dynasties (1644-1911). Zhujiajiao is the best-preserved ancient water town among the four ancient towns in Shanghai. In the period of the Three Kingdoms, there were already country fairs in Zhujiajiao and the business prospered in the Ming Dynasty. Now Zhujiajiao is a graceful and quiet town. Walking on the zigzag stone pathway and the winding long lanes, you would feel like walking in an elegant and fresh painting. Small rivers shaded by willow trees, bridges over the river, houses dated back to the ming and Qing Dynasties, unsophisticated local people, all of these are the charm of the small town. Like several other water towns in this area, Zhujiajiao has numerous historical sites and private gardens, which were designed and built between the Qing and Ming dynasties. Between the ancient architecture, Kezhi Park (Majia Garden) situated on North Street is the biggest manor style private park in this town and also one of the largest gardens in the southern China area. The Lawn features lovely sights in quiet and private surroundings. It mainly consists of three parts - a gallery, an artificial hill and a park. In the hill area, there is another piece of magnificent, symbolic architecture - a foursquare five-story building, on the top of which stands a diametric pavilion named &apos;Moon View Pavilion.&apos; This building is considered the tallest architecture in the town. 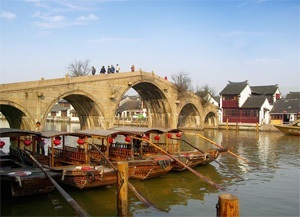 Built in the 17th century, the 70-meter-long Fangsheng Bridge is now the most well-known landmark in Zhujiajiao. Fangsheng means release animals in Chinese. Local people believe releasing animals means you are merciful to animals and Buddha will also be merciful to you. 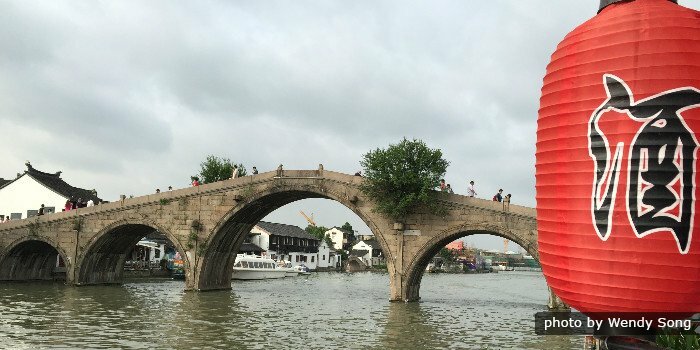 The arch of the bridge and the beautiful views on the bridge make it enjoy a reputation of the “Rainbow of Zhujiajiao”. Covering an area of 2000 square meters (21527 square feet), the Zhujiajiao Culture and Art museum tells you the history and culture of Zhujiajiao via paintings and statues. Visiting the museum before visiting the town helps you know the development to Zhujiajiao better. That’s why this museum is built at the entrance of Zhujiajiao Water Town. Built in 1903, the old post office witnessed the development of China’s postal service. Thousands of ancient stamps, envelops and post cards are collected in the two-floor building. Four paintings on the second floor show you how postmen delivered letters in ancient time. Usually, a City God Temple is built to commemorate a local hero and it looks more like a temple, but the one in Zhujiajiao is different. It looks like a garden more than a temple. Visitors can take a rest and admire the exquisite rockery, pool and pavilions in the temple area. The Handcraft Exhibition Hall in Zhujiajiao is located in a house with a history of over 200 years. Hundreds of Artists from all over China send their masterworks to this hall, so the exhibitions are changed from time to time. Although it is Buddhist temple, there are not so many statues of Buddha in the temple. The terrace on the Qinghua Pavilion in the temple offers tourist a good place to admire the views of Zhujiajiao. Take Shanghai metro line 17 and get off at Zhujiajiao Stop. If you want to take a bus please check out the information below. 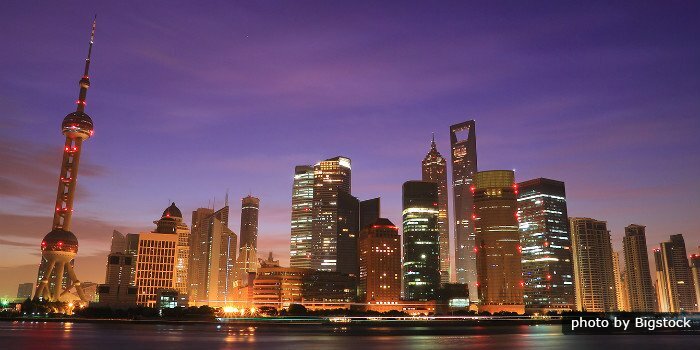 Take the tourism bus at Shanghai Stadium (Gate 5) or Hongkou Soccer Stadium to Zhujiajiao in the morning. Take the Huzhu (Shanghai-Zhujiajiao) Special Line at Laochengdu Road and Yan&apos;an Road and get off at Zhujiajiao Station. The bus runs between 7:00 and 17:45 to Zhujiajiao every 10 minutes, and returns from 5:50 to 17:15. Take Huzhu Express Line at People’s Square Pu&apos;an Road Jinling Road and arrive in Zhujiajiao one hour later. There is a bus every half an hour. Take Shangzhu Line at the Shanghai South Railway Station or Shangtai Line at North Caixi Road Bus Terminus to Qingpu Bus Station first. Then there is a bus every 10 minutes to Zhujiajiao.